Ben F. Smith, Inc.® is headquartered in El Monte (Los Angeles) on a three acre site housing the main office and warehouse facilities. Our office staff includes top clerical personnel and a well-qualified group of estimators/project managers utilizing modern computer equipment. Our estimators not only bid the project but also manage the contract. Consequently, our customers are dealing with one person from the inception of the project to its completion. Our company is capable of doing almost any type of structural commercial work, as well as architectural site work utilizing special finishes. 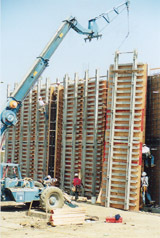 We have had the good fortune to work for some of the largest general contractors in Southern California. The main Los Angeles office and yard is headquartered on a three acre site in El Monte.